Most have gone to Turkey, Lebanon, and Jordan. Worldwide, 59.5 million people are on the move as refugees or displaced people within their home countries. That population would be enough to make them citizens of the world's 24th biggest country. "Wars, conflict and persecution have forced more people than at any other time since records began to flee their homes and seek refuge and safety elsewhere," the United Nations said in June. At least 15 wars and conflicts are to blame -- in Africa, the Mideast and Asia. In addition to the great traditional Christian hymn, Love That Will Not Let Me Go, Phil and Amy have also chosen this great praise tune for their wedding this weekend. How could I not be absolutely chuffed with both of their choices? The God we know in Christ is truly worthy of all our praise, honor, and glory for 10,000 years and an eternity more. Who do I owe my thankfulness? The New Testament book of Philemon isn't the longest of the Bible. It has just one short chapter. But reading it this morning as part of my 5 by 5 by 5 devotion time gave me plenty of material for consideration and prayer. Philemon was a wealthy leader of the first-century church, probably in Colossae. His slave, Onesimus, also a Christian, ran away from Philemon and ended up helping the apostle Paul, then being held prisoner in Rome for his faith in Christ. Paul is sending Onesimus back to Philemon accompanied by this short letter. Paul is very shrewd here (and elsewhere). He never overtly advocates the end of the Roman slavery system, but he asks Philemon to no longer treat Onesimus as he would a slave, but as a brother in Christ, an equal in the eyes of God, differing from Philemon not in status but only in function. Christians believe that they have been saved from sin and death and given new and everlasting life by the grace of God given to all who trust in Jesus Christ as God, the only One Who can give forgiveness of sins and life from God. We're right to give thanks and praise to God alone for this great gift. But no one comes to faith in Christ or to a growing, consoling, empowering faith in Christ, in a vacuum. No one wakes up one morning and says, "I believe in Christ." And no one's faith deepens without the help of mentors and friends in Christ. There has to be someone--usually many someones--who share Christ with us. Otherwise, the human default mode, being to go it alone and to be our own gods without accountability to anyone else, we would never know about Christ and the forgiveness of sin and new life given to all who trust in this crucified and risen Savior. God saves people for eternal life with God through their faith in Christ. But God commissions people--people who gave perfect witness to Him on the pages of Scripture, Christians who share their imperfect lives and the perfect good news about Jesus with friends and family, and others--to "preach," proclaim, teach, and give away their best friend and Lord Jesus to others. This morning, I'm taking Paul's words to Philemon as words to me. I'm taking the time to think about all of the people to whom I owe my eternal life because, in the power of God's Holy Spirit, they took and they take the time to share the life of Jesus with me. This includes people from my past and people from my present. I'm taking the time to name each one before the Lord and to thank Him for their witness. I'm offering a special prayer for those who are witnesses for Christ in my life right now, asking God to bless and protect them and their families and to help them sense His loving arms around them today. I'm also offering prayers of thanksgiving for those now with the Lord in eternity, the sainted dead, whose witness for Christ has built up my faith in Christ--people like Martha S, Bruce S, Ron C, Karen H, Great Grandma Henry, Uncle Carl and Aunt Betty, and Sarah S, to name just a few. I'm asking God, as I pray, to give them special embraces symbolic of my thankfulness to them and to remind them that I so look forward to seeing them again soon. My hope for eternity is one I possess because they and others have faithfully shared Christ with me and prayed to God the Father in Christ's name for me. How can I not be filled with thanksgiving? It's not a bad idea to thank God for the people to whom we owe our connection to Christ, the life-giver. You may want to do so sometime today too. ...They obey all the traffic laws. One Google car, in a test in 2009, couldn't get through a four-way stop because its sensors kept waiting for other (human) drivers to stop completely and let it go. The human drivers kept inching forward, looking for the advantage — paralyzing Google's robot. The idea of a self-driving car appeals to me a lot. But the four way stop on my daily commute, where some drivers are intent on not taking their turns, show me why the obedience of self-driving prototypes present them with obstacles. 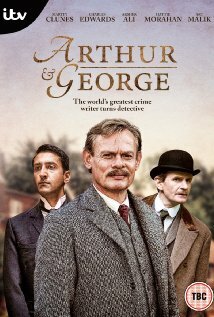 A fan of Arthur Conan Doyle's Sherlock Holmes stories since reading The Adventures of Sherlock Holmes for English class in the seventh grade and a fan of Martin Clunes' work on Doc Martin, I was interested in watching the premier of Arthur and George, starring Clunes, last night. I enjoyed the first episode. I knew a little about Doyle. I knew that while he patterned Holmes after a diagnostician under whom he studied while in medical school, Holmes was more of an alter ego to the keenly observant Doyle than of the fictional doctor who narrates the Holmes corpus, Watson. I knew that Doyle was devoted to spiritualism. I also knew that he became an acquaintance with Agatha Christie, after the latter, who boldly stole the basic ideas for the main characters in her early Poirot stories--Holmes=Poirot, Watson=Hastings, Lestrade=Japp, Mrs. Hudson=Miss Lemon--had risen to fame. And I knew that after Christie's first husband had betrayed her and she had, deeply depressed, disappeared, a concerned Doyle offered a substantial sum of money to anyone who could help materially in finding her. The other thing I wondered about was a character in last night's episode, Jean Leckie. According to the show, while Doyle was married, he had conducted an ongoing and unconsummated relationship with Leckie. Last night, Clune's Doyle, following the death of his wife, makes understated Victorian overtures to Jean about getting married and the Leckie character tells him that they must wait for a period of time to pass before that happens. Were they juicing up Arthur and George's story line for twenty-first century TV audiences? In 1885 Doyle married Mary Louise (sometimes called "Louisa") Hawkins, the youngest daughter of J. Hawkins, of Minsterworth, Gloucestershire, and sister of one of Doyle's patients. She suffered from tuberculosis and died on 4 July 1906. The following year he married Jean Elizabeth Leckie, whom he had first met and fallen in love with in 1897. He had maintained a platonic relationship with Jean while his first wife was still alive, out of loyalty to her. Jean died in London on 27 June 1940. Apparently, Arthur and George has it right about Doyle and Leckie. And that impresses me for several reasons. One is that so many screen dramatizations of real people's lives play fast and loose with the facts. The other is to consider how remarkable the real life Doyle and Leckie were. Here were two people deeply in love with each other who refrained from intimacy when they could have been together--even in the Victorian Era, the high and mighty, which Doyle was, could get away with behavior that would otherwise be considered scandalous--all because Doyle remained loyal to his wife. The Victorian Age may not have been as primitive as it's often portrayed as being. Today, I want to talk with you about miracles. Particularly, the miracles performed by Jesus and, in our own day, the miracles that come when people call out to God in Jesus’ name. Probably all of us have experienced the agony of prayers offered for loved ones or for ourselves when God seemed to ignore what we prayed for, when the miracles we've sought haven't come. Nothing is more painful or haunting for the believer in Christ than this. And it's something I want to ask the Lord about when I get to see Him face to face in eternity. But I’m confident that if we were to poll this group of worshipers this morning, a majority of us would affirm not only that Jesus works miracles, but also that we know of at least one miracle from our own lives or from the lives of those we know, that can only be attributed to Christ. When I had a heart attack five years ago, I had what's called the widow maker, a 100% blockage of the left anterior descending artery, I was told by my cardiologist that, given the lack of risk factors on my part, he had no way of explaining why I'd had the heart attack. He also said that he was also nearly as baffled by my survival. (My body had developed lots of ancillary arteries that were picking up the slack.) But his nurse cut to the chase on this last point. I survived, she said, because God had things for me to do. I believe in miracles. Let’s acknowledge something, though: Whenever we Christians talk about miracles, we’re in dangerous territory. One reason this is true is that there are televangelists who have built vast empires on their claims that God wants our entire earthly lives to be miraculous walks in the park and that if we haven’t experienced a miracle in the past twenty-four hours, there must be some deficiency in our faith. It’s a deficiency likely to be cured, they imply, if we’ll send their ministries a $100 love-offering. But this notion of miracles being the normal mode of life on this earth flies in the face of Biblical truth. The most common Greek New Testament word which we translate into English as miracle is semeia. As we’ve pointed out before, it’s a word that literally means sign. Whenever Jesus perform a miracle even today, He takes the chance that some people will be so astonished by the miracle that they fail to see the sign that the miracle gives. Every one of Jesus’ miracles point to His lordship over the universe. They're signs of His capacity to conquer and destroy the power of sin and death over our lives, which was fully accomplished on the first Easter, when He rose from the dead. All of Jesus’ miracles call us to faith in Him, not in the sign. To believe in the miracle and not the miracle worker is to pursue a “what’s-in-it-for-me-now?” religion. It’s utilitarian. To believe in the miracle-worker is to know that God is for me, whether things are going badly for me or whether, as a sign of His grace and power, Jesus visits me with a miracle. Jesus performs two miracles in today’s gospel lesson. In addition to their being signs of His dominion over life and death, they also are signs of another truth about life in His Kingdom. Let’s take a look at this lesson, Mark 7:24-37. First though, let’s set the scene because understanding the context in which these incidents take place is a key to understanding what Jesus wants to tell us today. Our gospel lesson picks up the narratives from Mark’s gospel that we looked at during the past two weeks. Two weeks ago, Jesus declared that His disciples were not defiled by failing to observe ritual cleansing before sitting down to dinner. Last week, He told us that nothing from outside of us can render us unclean in the eyes of God, only the sins that come from inside of us can make us unclean. After declaring that all foods were clean, Jesus goes to Gentile territory, a place that His critics would have regarded as unclean. He goes there apparently to rest, not to minister. But by simply going to this Gentile territory, Jesus was making clear that no place, no person, no nation, is so unclean or so distant from God that they're beyond the scope of God’s dominion or grace. This scene violates so many cultural norms of Jesus’ day that if the Pharisees had seen it, they might have gone crazy! In a Gentile house, a Gentile woman dares to speak to a Jewish man in front of other Jewish men. And this unclean woman asks that this Jewish man would employ the power of Judea’s God to cast a demon from her Gentile, unclean daughter. The cultural norms of Jesus’ day would have said that He should turn His back on this foreigner, that He should spurn her, that He should ignore her desperate need. So, rather than rejecting this woman, Jesus decides to teach His disciples, including you and me, an important lesson by satirizing cultural norms and, in a friendly exchange, bantering with this woman before saying yes to her prayer. Jesus first signals that He intends to honor the woman’s request when He says, “Let the children be fed first.” The implication is that she will be fed second. In Jesus’ Kingdom, there’s plenty of love to go around, whether we’re Americans or Syrians, Iraqis or whatever. Jesus saw her faith and He delivered her daughter from evil. A second Gentile, this one a man and this one suffering from a physical rather than a spiritual ailment. As was true of the little girl, someone else came to present the man’s need to Jesus. In effect, they prayed to Jesus, just as we do when we pray for those who have spiritual or physical needs. Again, Jesus doesn’t turn His back on these foreign petitioners. He honors their faith in Him. He performs a miracle. Jesus told the crowds not to tell others about the miracle because He knew the danger of worshiping the miracle instead of the miracle worker. Jesus didn’t want people to see Him as genie who could be bottled up until we get into a jam, a pushover who will bend to our wills and otherwise leave us alone. To see Jesus in that way is to miss the point and it is to be far from Him and the eternal life He gives to all who turn from sin and believe in Him as God and Messiah. Jesus wanted--Jesus still wants--all people to see Him for Who He is: Lord of heaven and earth; God in flesh appearing; the hope of sinners; the only way to life with God; the only way to sanity and peace. As someone has pointed out, there were many people who suffered from spiritual and physical ailment who Jesus, in His time on earth, never met or had the opportunity to heal. Today, we who confess Christ are the beneficiaries of His greatest miracle and sign: His death, in which He bore our condemnation for sin, and His resurrection, in which He opens up everlasting life free of sin and death, to all who trust in Him. And today, He calls us to go where He never went in His time on earth, sharing the benefit of His death and resurrection with others: praying for the hurting; serving our neighbors; and making disciples of Christ through our confident sharing of the good news of Jesus. In fact, Jesus says that we will do greater works in His name as His Church than He was able to do confined to His singular human life in first-century Judea, precisely because we can pray, serve, and make disciples in the power of His name! Jesus always performed His miracles as signs of His dominion over life and death. But in the miracles we’ve looked at today, He also gave signs that no one is beyond the scope of His grace and lordship and that we who confess Him as Lord, should see everyone as worthy of our prayers, our compassion, our help, and our proclamation of Jesus as the way, the truth, and the life. May God help we redeemed sinners, bought out of death by the blood of Jesus Christ, to see others, even those who hate us, as our mission field.